Well, guess what? Here’s another scarf. I’m using another variegated sock yarn for this one. I found the combination of the rich fall tones – gold, deep orange, forest green – and the navy blue and white a little strange when I started working with this yarn. I still don’t think it would be my choice if I were designing a variegated yarn, but the colors are growing on me a bit. I think this scarf would be a great complement to a white shirt and dark slacks. I still have tons of scarves going at once. One of them (this one) is all knit up and off needles, but I still need to add fringes, weave in the ends, and maybe block it. I have others that are close to finished, and this morning I started a new one. I like knitting for long periods without having to stare at the same color pattern and work the same stitch patterns over and over. This design is called “Forgiving Scarf II.” Long story, and yes, there is a Forgiving Scarf I. Once I have a few done and can take pictures of the finished products, I’ll tell you a little more about how I named them. On the reading side of things, I am still sampling a number of books without really committing (isn’t it funny that my knitting life and my reading life are so in sync right now?). In February, I will be taking a writing workshop, and I have a number of books and short stories that I’m assigned to read for that course. 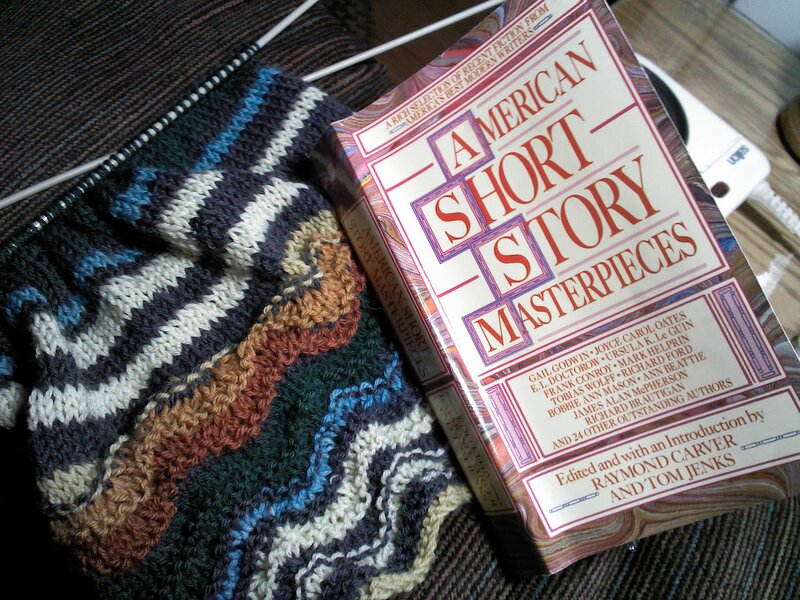 I just started reading American Short Story Masterpieces. I’ve read the first two stories – James Baldwin’s “Sonny’s Blues” and Ann Beattie’s “Weekend” – and loved both of them. I can’t imagine how I’ve managed to get this far in life without reading “Sonny’s Blues”; it’s only in every single textbook I’ve ever used in my classes. I think I managed to trick myself into assuming that the fact that I hadn’t read it meant that clearly I had started it at some point and disliked it and therefore never finished. But the minute I started reading, I knew that I had never read it before. It’s a great story – a near perfect story. I’m looking forward to more. Happy Wednesday, everyone! As always, Yarn Along is hosted by Ginny at her blog Small Things. I like your scarf. I agree that it will complement a white shirt with dark pants. Thanks! It’s quite a bit longer now, and I’m liking it more and more. I like your yarn combinations on that. Thanks! It’s a variegated yarn, so I can’t take credit for the color choices. I like it too.